After touring the globe, the legendary cabaret YUMMY is back at FRINGE WORLD! Join the ever fabulous and award-winning ensemble as they take you on the most delicious and unpredictable ride of your life. YUMMY DELUXE is a mix of new acts and YUMMY favourites with some electric new cast members. Winners of "Best Production" and "Best Ensemble" (Cabaret) at the 2018 Green Room Awards, YUMMY has become synonymous with breath-taking drag, music, circus, and burlesque. Come and join the stars of YUMMY as they lead a new wave of outrageous, joyful, and innovative cabaret. YUMMY Productions is a force in Australian performing arts. Known for the cult smash show, "YUMMY," the company has also created spin off productions: "SUMMER TREATS" and "WINTERSWEET," and numerous tailor-made events. Directed by James Welsby, YUMMY is born from Melbourne's Midsumma festival, and has presented shows in Brisbane Festival, Edinburgh Fringe, Right Royal Cabaret Festival, Sydney Mardi Gras, Melbourne International Comedy Festival, Adelaide Fringe, Melbourne Music Week, FRINGE WORLD, and more. YUMMY has been described as: "a striking sense of imagination" (The Times UK, 2018), "a must see" (The Advertiser, 2018), and as "fresh, new and you’ll never have seen anything like it" (The Scotsman, 2018). YUMMY won "Best Ensemble" and "Best Production" at the 2018 Green Room Awards. The session on Friday 15 February at 9:45pm will be audio described by DADAA. Please visit the accessibility page of our website for more information. 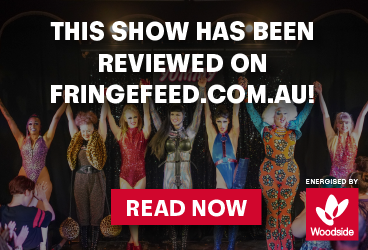 Please note, you will need to email access@fringeworld.com.au 72 hours ahead of the session to ensure we can notify our Front of House and venue crew.